Get a grip on this: sometimes in life and fashion, you come to find that you need a little bit of structure. And so the top handle remains one of my favourite kinds of architectural accessory. Boasting a boxy silhouette, genteel attitude and when elegantly wrapped with a silk scarf, the bag lends a polished finish to all ensembles. Whether worn on the elbow or merely being toted, the top handle is a ladylike winner and can take you from brunch to the office without losing serious style factor. Certainly, nothing defines the upcoming summer season like the vigour of a perfect mustard bag. Moving on, it’s time to make room in your wardrobe because one can never have too many bucket bags. The spacious accessory is both roomy and unfussy, and I guarantee that it will stay on for plenty of years. 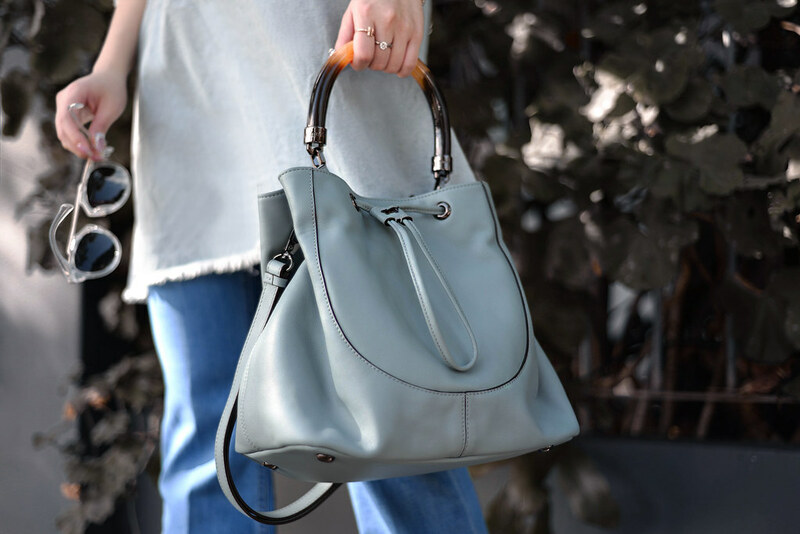 In particular, this evolved version features nappa calf leather with gunmetal finish and a top resin handle for you to literally grab and go. Coming back to our favourite Dijon-mustard, it’s about time you got the memo: Colour is in, and colour is everywhere. Open your heart. See what else I’ve been up to on Instagram, Facebook and Twitter!